Dean Martin and Jerry Lewis first became famous as a nightclub act, graduating to radio, television and the movies. It was a very successful partnership, but it was a partnership that had its’ share of tension and personality conflicts. The movie The Stooge mirrors that conflict, as well as recreating some of their hilarious night club act. 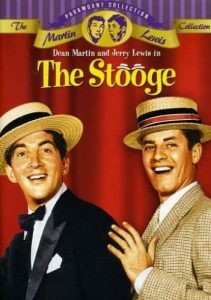 In The Stooge, Dean Martin plays the role of Bill Miller, a struggling vaudeville entertainer in need of good material and success. After the loss of a partner and a failed attempt as a solo act, he desperately agrees to hire a “stooge”. A “stooge” is an entertainer planted in the audience as comedy relief (in fact, that’s where the Three Stooges got their name — the act was originally Ted Healy and his Three Stooges). The Stooge is, of course, Jerry Lewis, playing the role of Ted Rogers. Chemistry is established between the two, and the act soon rockets to success, followed shortly after by the conflicts between the two men: Dean Martin’s character, Bill Miller has a swollen ego makes it impossible for him to share the credit for their success, or to give equal billing. This conflict leads to the climactic stage scene; if you think that the movie ends with the partnership dissolving, you’re wrong. To see how the movie really ends, you’ll have to see it for yourself. Along the way, there are several presentations of Martin and Lewis’ own stage act, which is utterly hilarious. Jerry Lewis plays his normal character, although with more humanity than normal, and Martin’s dramatic moments truly stick out as examples of the very good actor that Dean Martin could be. Bill Miller (Dean Martin, Rio Bravo, Scared Stiff). A talented singer, who breaks up with his comic partner, to prove that he can make it on his own. But he can’t. At the urging of his manager, he hires a Stooge to plant in the audience. Soon, the act’s a success — but Bill’s ego won’t let him share the credit. Until, towards the end, he swallows a large slice of humble pie. Ted Rogers (Jerry Lewis, The Nutty Professor, The Disorderly Orderly). The bumbling, inept man-child that Bill hires. At first, Ted is Jerry’s lovable klutz — but he gradually changes and grows, becoming Bill’s best friend and true partner. A very good performance by Jerry Lewis. Mary Turner (Polly Bergen, Cape Fear, At War with the Army). Bill’s fiancee, who marries Bill at the beginning of the movie. She has to try to deal with Bill’s ego and its’ negative impact on their marriage. Genevieve ‘Frecklehead’ Tait (Marion Marshall, I was a Male War Bride, That’s My Boy). The freckle-faced girl who starts falling for Ted at his first performance. He falls in love with her as well, and she encourages him to stand up for himself. Leo Lyman (Eddie Mayehoff, Artists and Models, That’s My Boy). Bill’s agent, who first urges Bill to hire a Stooge, and save his act. Throughout the film, he acts as a friend – and conscience – for Bill. Ben Bailey (Richard Erdman, Tora! Tora! Tora!, Community). Bill’s first comic partner, who later causes a scene. He punches out Ted and gets knocked out by Bill for it. Mrs. Rogers (Frances Bavier, The Andy Griffith Show, The Day the Earth Stood Still). Ted’s loving mother. In The Stooge, Bill Miller (Dean Martin) has found modest success as a singer in the off-vaudeville circuit. Teaming up with a comic (Jerry Lewis) proves to be the best thing for Bill, as his routine becomes an instant success, but mainly because of the clown he takes on as his partner. Unable to admit it, Bill knows he owes his success to his sidekick, the stooge. Jerry Lewis calls this his favorite of the Martin & Lewis productions. Though filmed in 1951, it was held up release till 1953 because Paramount was unsure of its box office appeal due to its extensive dramatic moments. Sam Robertson: [Referring to Ted Rogers] Tell me the truth, Miss Regan, do you honestly think he’s human? Miss Regan, Robertson’s Secretary: I’ve heard people bet both ways. Ted Rogers (Jerry Lewis): Well, my mother loves me. Bill Miller (Dean Martin): I’ll bet she was disappointed. I’ll bet she wanted a child. Ted Rogers (Jerry Lewis): She got one. Look up the records. I was born at Mercy Hospital. Bill Miller (Dean Martin): Were you sick? Ted Rogers (Jerry Lewis): No, I wanted to be near my mother. Mary Turner (Polly Bergen): [whispering] Don’t you think Ted has had enough? Ted Rogers (Jerry Lewis): You whisperin’ about me? Bill Miller (Dean Martin): Oh, no. What gives you that idea? Ted Rogers (Jerry Lewis): “Extraordinary”. That’s a funny one. Mary Turner (Polly Bergen): How do you feel? Ted Rogers (Jerry Lewis): I feel very … gling glong. Thank you. Bill Miller (Dean Martin): Gling glong? Ted Rogers (Jerry Lewis): [to Frecklehead] How long have you had freckles? Genevieve ‘Frecklehead’ Tait: All my life! I hate them! Ted Rogers (Jerry Lewis): Well, I think they are very becoming. Genevieve ‘Frecklehead’ Tait: [Angrily] Shows what you know!